With fast Internet speeds, cell phones that allow you to connect practically anywhere in the world, and advances inn video conferencing technology, working from home has never been easier. While many of the people who work from home are freelancers or entrepreneurs trying to make a name for themselves, many corporations are starting to allow their trusted employees to work remotely. Working from home definitely has its conveniences: you avoid commute times and don’t have to get dressed up to do your job. However, there are also unique challenges you’ll face if you work from home. It can be hard to focus on your work when you’re sitting at the kitchen table staring at a pile of dirty dishes, and there are plenty of other distractions you won’t find at the office. Perhaps the key to successfully working at home is to carve out a space that is enticing and fits your needs. 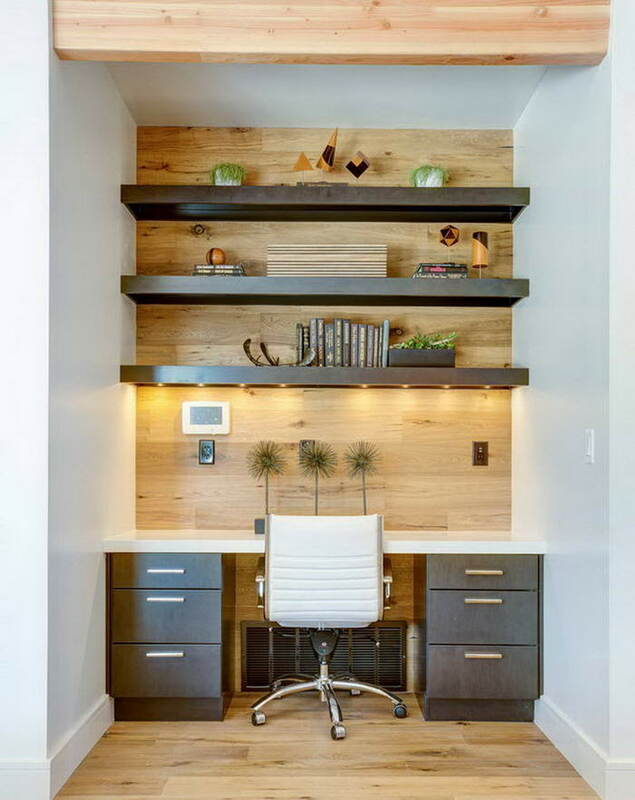 While we recognize that no two homes are alike, we hope that you’ll be inspired by some of these home office ideas. A few small tweaks to your space could make a big difference in your productivity. This large L-shaped desk is the perfect solution for those who need a lot of space to do their job. You can have a computer on one side and open space for crafts, drawings, or whatever else you need on the other side. The predominately white space shown here is relaxing and elegant, especially with the hanging chandelier for light. 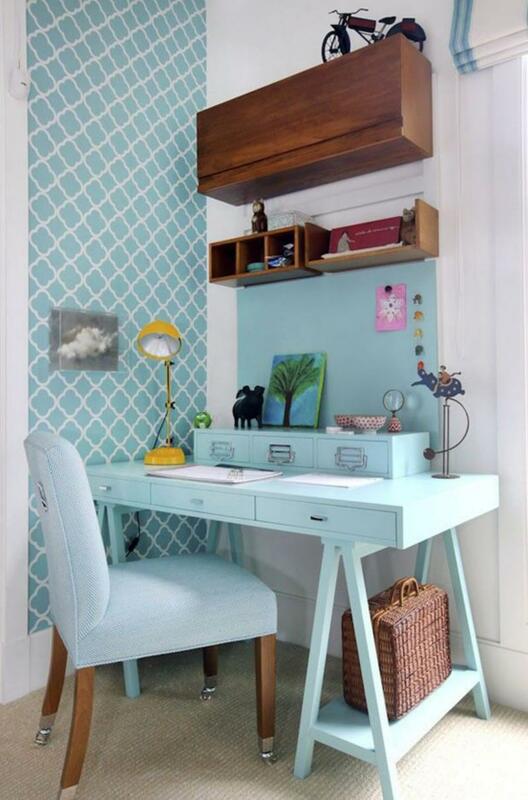 However, the light blue color of the desk lends a fun pop of color. Set against the wall, the ornate hutch almost looks like built-in shelving, but it’s not. Completing the space is the artwork with an inspirational quote. Customize that to something that appeals to you. Not everyone has enough space for a full office in their house, and this picture shows how easy it is to transform a small nook in the home into an elegant and workable space. Having the desk and shelves stretch fully across the nook makes the space feel bigger, while the natural wood backsplash and touch of greenery in the plants gives it a homey feel. Large filing cabinets are perfect for storing client files, but you could choose to use smaller drawers if you have different needs. The bright colors in this office design are sure to wake up your mind and help you stay focused, and mounting the very large computer screen on the wall is a great way to maximize the use of a small space. It allows you to use a small table for a desk rather than a large desk that would otherwise eat up the space. Floor-to-ceiling shelving offers ample storage space for whatever you may need, but what ties it together is the use of orange storage containers in different styles and sizes. When you’re choosing such bold colors for the walls and accessories, having simple artwork, like the black and white pictures here, is a good design choice. 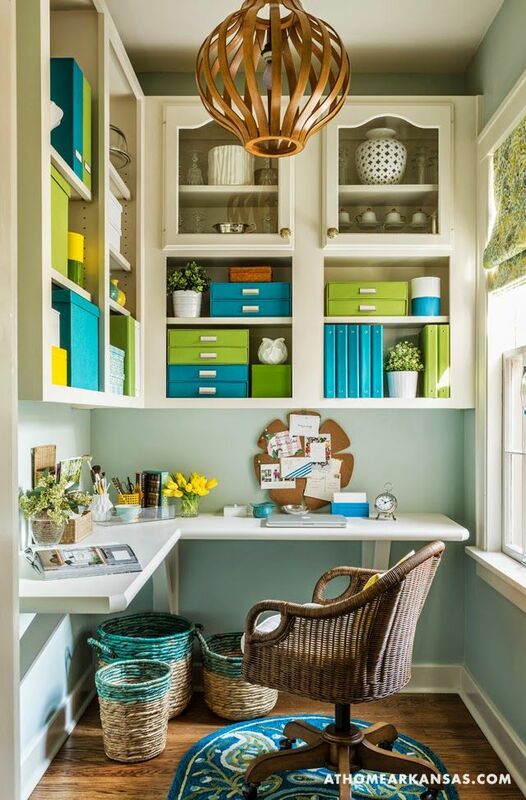 This look is perfect for those looking for home office decorating ideas that minimize the clutter. A clean space means a clean mind. 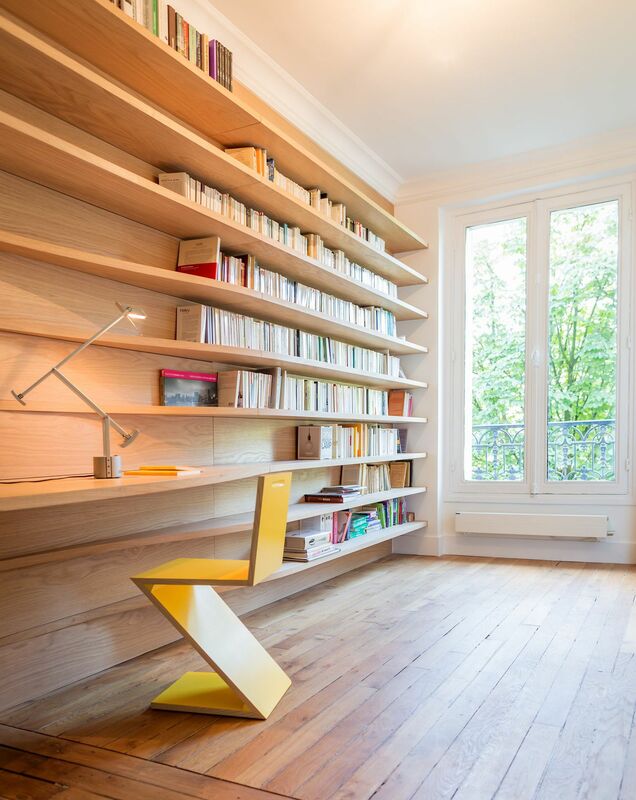 With the shelving that takes up the full wall, there’s plenty of space to store books and a uniquely modern chair makes the room – and your work – more interesting. This might be the perfect little nook for a writer. However, if you do need more storage space, don’t fret. Simply buy some cute storage boxes and place them on the shelves instead of books. Make the idea work for you. If you prefer elegant home decor, look no further. The almost-white walls and natural light from the doors makes this workspace bright and airy, while plush chairs add comfort and style to this workspace-for-two. The built-in shelving here might have once stored the family’s china, but it’s now an ideal place to keep your work supplies. Note the design on the ceiling, which tends to make the room look bigger than it is. The great thing about this working area is that it can easily double as a place to share a cup of tea with a friend. The legs of this DIY writing desk may look like they come out of a carpenter’s workroom, but the coat of light blue paint assures you they do not. The number of small drawers are perfect for holding stationery and other things you might need to hand write letters to your friends. Patterned wallpaper and the artwork add a much-appreciated touch of fantasy to the office. This space works best for someone looking for a small workspace that fits their home design. 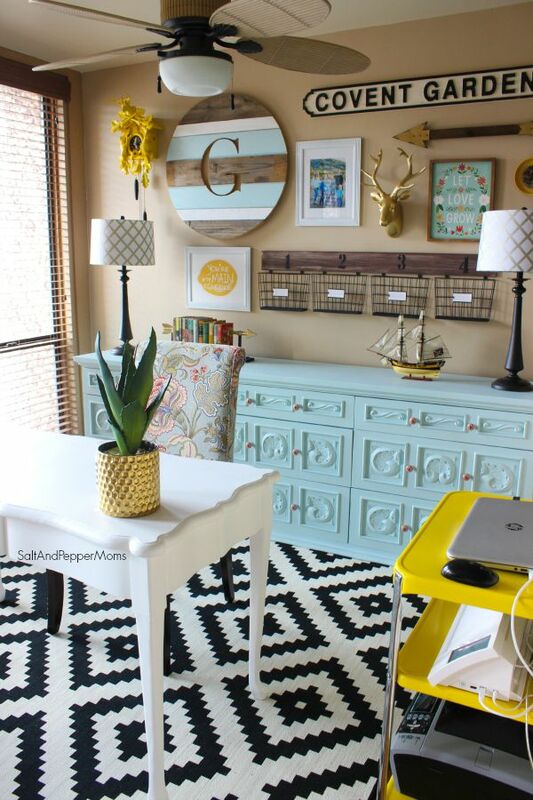 Sometimes, you need home office decorating ideas that are going to make you feel inspired to get down to work. This brilliant design certainly fits the bill. 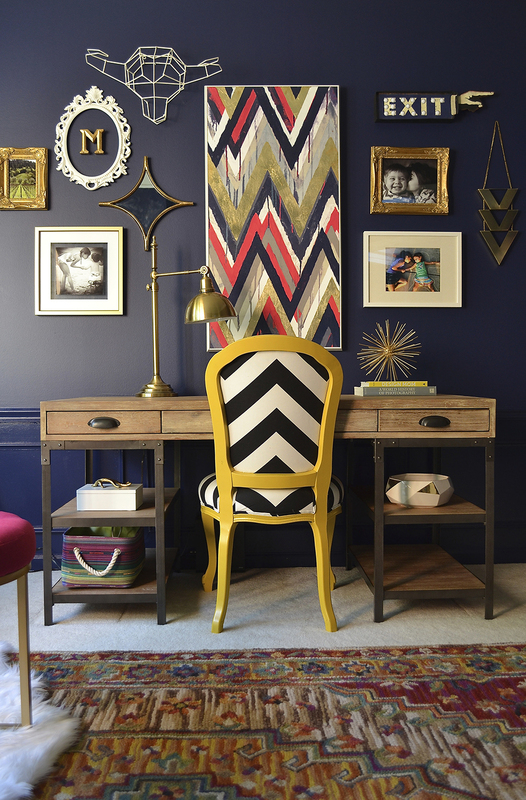 Navy blue on the walls is a bold choice that’s softened by the gold and white accents and colorful pops on the walls. There’s a clean space to work and a small bit of storage space. This desk is tucked to the side of a wider living area, which goes to show that you can still have a dedicated place for your work even if you don’t have an entire room to use. This ingenious space is ideal for families that have more than one person working from home. It makes use of the space at the top of the stairs – a spot that might otherwise go unused – and there’s plenty of room for two separate work areas. Adding color to the inside of the shelves is an interesting twist and the zebra-skin rug on the floor is a great conversation piece. Since this space is out in the open, you need to make use of the storage areas to keep things tidy. When you’re looking for home office design ideas, sometimes you’re trying to create an office out of a small space like a pantry or walk-in closet. This picture shows a cute way of making your small space look great. The L-shaped desk is mounted to the wall, giving plenty of workspace. You could easily customize the size of this to fit your own space. Hanging cupboards above the desk gives you ample storage space to stash your things. What really ties this office together is the bright colors of the containers and the wicker in the chair and baskets, along with the wicker-inspired light fixture. If you have the space to create an large, open office, take advantage of it, like you see in this picture. The desk area takes up the entire wall, while cupboard doors keep everything discretely hidden. An additional chair provides a separate reading area or space for a partner to sit while you bounce ideas off of each other. Choose artwork that makes you feel inspired – a picture of your pet or kids and a motivational message can help you stay on track when other home responsibilities seem to call out to you. 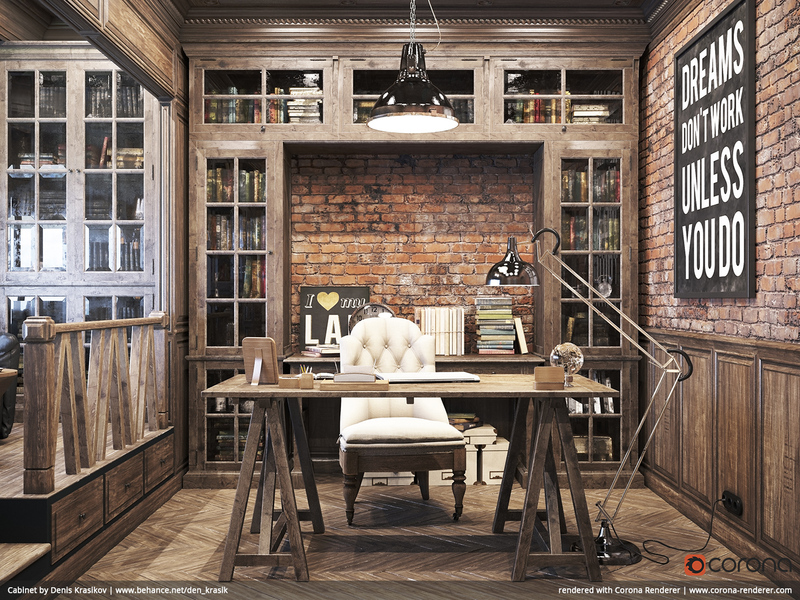 With its wood and brick motif, this unique home office blends nicely with the home decor in the attached room. With a commanding desk placed in the middle of the room, you’re bound to feel like a king – or at least the owner of a ranch. Having windows in the doors to the cupboards used for storage makes them feel open while still allowing you to contain some of the clutter. The focus piece, of course, is the large motivational art work. If you’re going to have something this big, make sure it’s something that really inspires you. Sometimes, all you need is a simple place to put your laptop when you need it. This home office is a practical part of the room’s design. Low shelving underneath the sprawling desk area houses the owner’s many books in a space that might otherwise have gone unused. What’s so inviting about this space is the wall that’s completely covered with art. The pieces are a mishmash of sizes and styles, yet they somehow all work together. This helps the orange and white chairs still look like they belong, even though they don’t match each other. 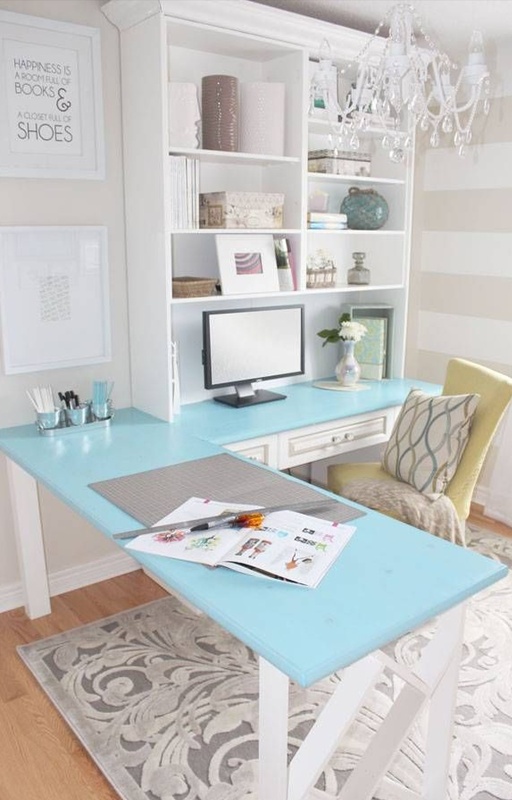 This office space is ideal for those looking for home office ideas that serve multiple purposes. A large cabinet in the back makes it easy to store your supplies out of the way, while hanging file holders are a convenient place to store things for your current projects. With a small cart to the side, you can easily stash away your laptop in order to use the desk for another activity. The busy design of the flooring calls for other aspects of the room to be a bit more subdued. It’s all about finding that balance. 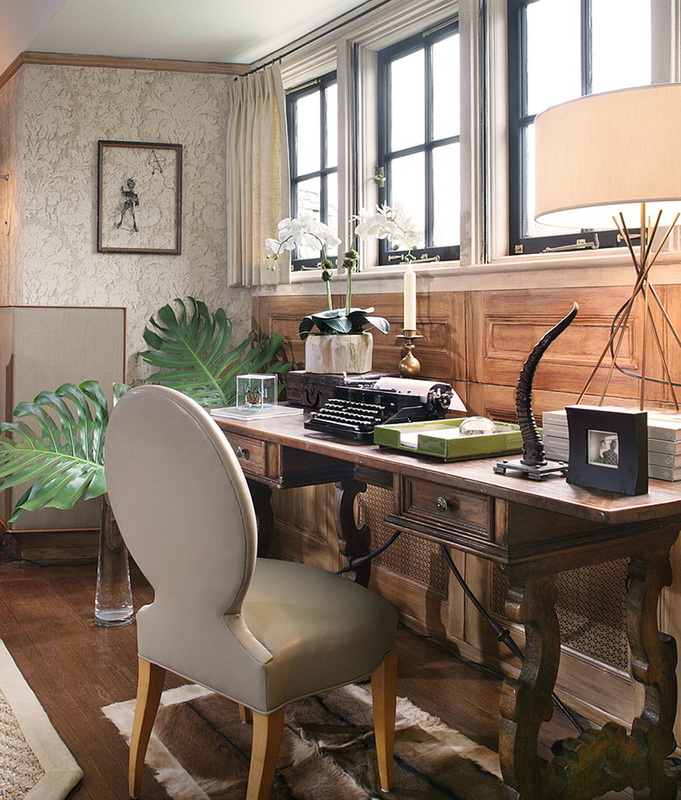 If you’re feeling like you might be the next Hemmingway, this home office is bound to keep you inspired. The room gets plenty of natural light, but the curtains can easily close at the nighttime when you want your privacy. Using older pieces as furniture for the office, as you’ll see with this desk, lends a certain aura, and the large green plants might make you feel like you’re in a jungle. While typewriter in this picture might be a bit too old fashioned to be practical, the rest of the room could hit your sweet spot.